Can someone tell Iberia what a meal is?! I spend last summer marking exam papers, and the reward is being able to go on a week’s holiday to the Caribbean in half term. Clearly, this is a fantastic opportunity for my wife and I to practice our French by visiting a French Island, and it will be nice to relax on a beach, but it is also very fortunate that there was a brilliant fare available at the time of booking. We were able to route from Madrid to St Martin via Miami, and then back via Miami to Heathrow for the princely sum of £995 each in Business. We could have got it for less, but this would have involved ending up in Paris and having to transfer back, so we decided not to. More on the trip to come, but in the mean time I want to reflect on our positioning flight. As I mentioned here, I can’t get to the airport before 1630 on a school Friday, so I had to book after work flights. I also knew that whilst BA run a wide bodied jet down to Madrid in the morning, as I tried out last summer, Iberia do an evening rotation. 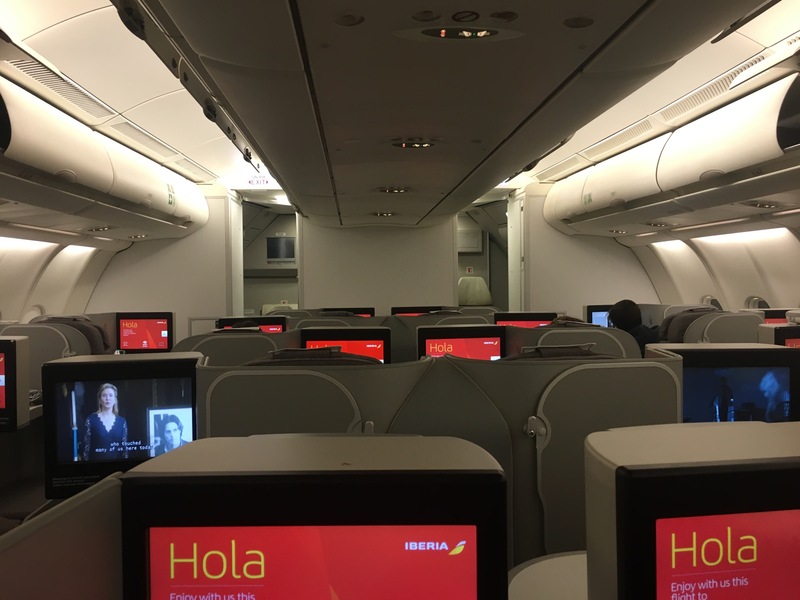 There were no Avios flights in business with BA Reward Flight Savers, but I was able to get 2 seats through Iberia. I paid £112 and 25,500 Avios for them, but was happy knowing that I would have extra leg room of the A330-300. The boarding was from T5C, which we reached via the underground walkways – I always love them as it feels like it is my private gangway as I think I have only ever seen 2 other passengers down there. We arrived perfectly just at the end of the priority boarding and were straight onto the aircraft. There in no hot towel service as on BA Club Europe, but the in flight entertainment and loads of leg room so I am not complaining! Dinner was soon to follow. 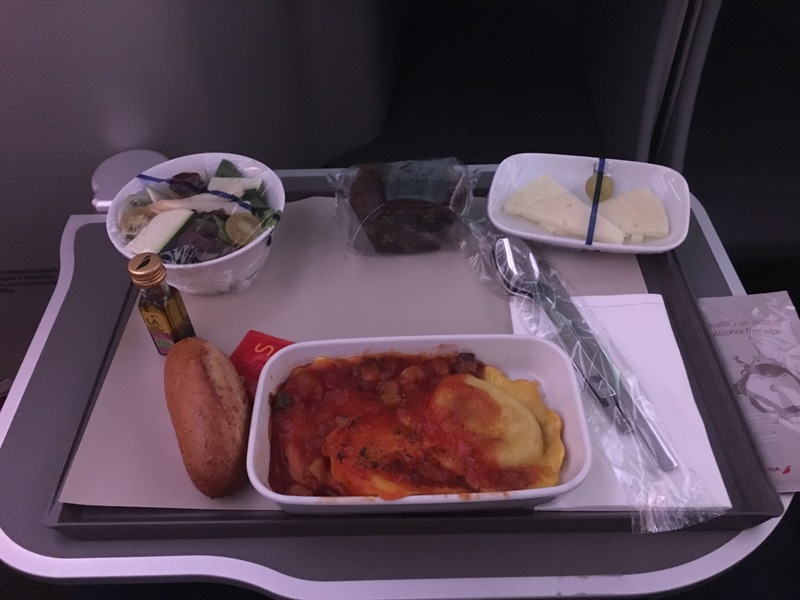 We had decided to order one special vegetarian meal and one normal, as I recalled having a really nice salmon pasta on a previous flight. Dinner was served and I chose the cheese pasta. My wife also did the same as we assumed that it would be the vegetarian option. 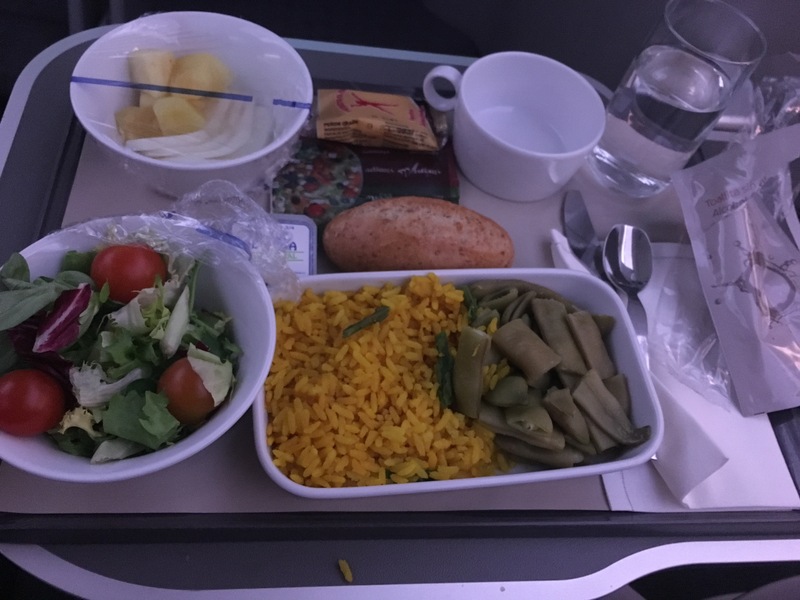 A moment later, another stewardess came and removed her tray, saying that her vegetarian main was on the way. Her original tray had a salad, manchego and cake; the new one had a plainer salad, fruit and no cake – all of it was vegetarian in the first place! The main arrived and it was incredible; literally a plate of rice and green beans. No sauce. No protein. Just rice and green beans. Being the kind of guy I am, I gave her half of mine. The rest of the flight was fine. We landed in T4S and I was able to make sure we took the right lifts and stood in the best place for the train to the main terminal. Next time you arrive at T4S, take the lift down to the train, stand at the front of the train immediately to your right, and when you board the train move over to the other side. When you arrive at T4, you can go directly to the lifts ahead of you on the right and you will soon be at baggage reclaim and the exit. A general top tip for Madrid is to take the lift over the escalators at all times because it is much quicker, except when transferring T4 – T4S as the passport check is one escalator up and not worth the lift! We were soon out and at the hotel shuttle bus stop waiting for our ride to the Crowne Plaza.